There were lots of things I learned when I first started dating Eric (and continue to learn). Three of those things being about sweet tea, Georgia, and peaches. I mean I did know about all these things before I started dating Eric but I quickly learned a great deal more. Since Eric and his family are from Georgia I am constantly told things like Texas is not ‘the true south’, despite what I think! “Everywhere you go in ‘the south’ you can get sweet tea,” Eric says. And sure enough, I realized not long after dating him that his favorite drink is hard to find here (unless you are at McDonald’s or a BBQ joint). I also learned that people from Georgia have lots of pride in their state. I mean I am from Texas and Texas pride is HUGE, larger than the actual state to be matter of fact! I mean the shape of Texas, and the Texas flag, and Texas ‘symbols’ such as the bluebonnet and longhorn, are found everywhere. From T-shirts, to cookie cutters, to purses, to being tattooed on people’s bodies. Texas tattoos… now that’s some pride! Now Eric, his family, and his Georgia friends have lots of pride too (heck, Eric’s brother has an outline of the state of Georgia with a big peach in the middle that says ‘on my mind’ as a tattoo as part of his sleeve) but I have never seen any group of people worship anyone, anything or any place, like Georgians worship the peach! Peach worshiping… now that’s pride! 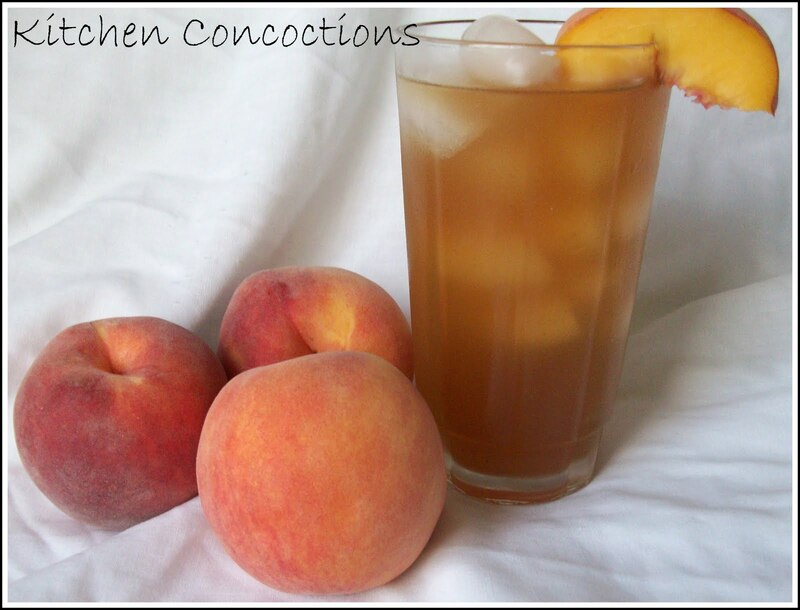 Well being the good girlfriend that I am I decided to make Eric a refreshing summertime drink that brought his favorite things together… sweet tea and peaches… to remind him of a favorite place… Georgia. Problem is I am not a tea drinker. I grew up around it, since I have family who drinks it, but I am not that familiar with it (at least I wasn’t before meeting Eric). So, after watching Eric make sweet many a time, I thought I could ‘wing it’ and figure out how to make peach sweet tea. My version and method is probably totally wrong but a couple of Georgia boys said it was ‘damn good’. And Eric is pretty proud that I am finally becoming a ‘true’ Southerner. PS. I think that I might be slightly jealous that Georgians have a fruit to worship. I love fruit too! With all the Texas pride where is our fruit worshiping? In a 1 gallon pitcher add the 3 quarts of hot water. Add the tea bags to the water and begin to soak. Peel and slice the peaches. 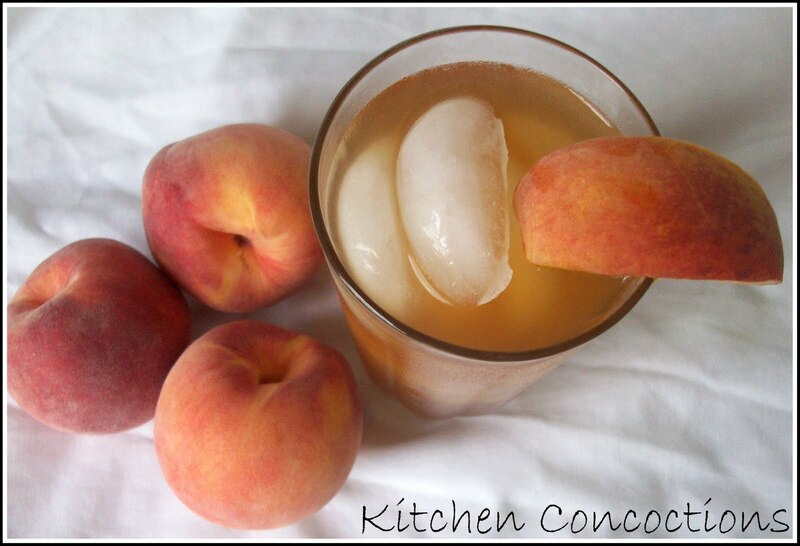 Place peaches in a food processor and blend until smooth. In a medium saucepan over medium-high heat, bring the 1 cup of water and sugar to a boil. Let boil for 2 minutes. Add the pureed peaches to the sugar mixture and cook for 2-3 minutes. Pour peach/sugar mixture through a mesh strainer into pitcher with tea bags and water. Let tea bags sit and brew with peach mixture for 15-20 more minutes. Remove tea bags. Strain fully prepared tea into a new 1 gallon pitcher. Serve over ice. Store leftovers in refrigerator.